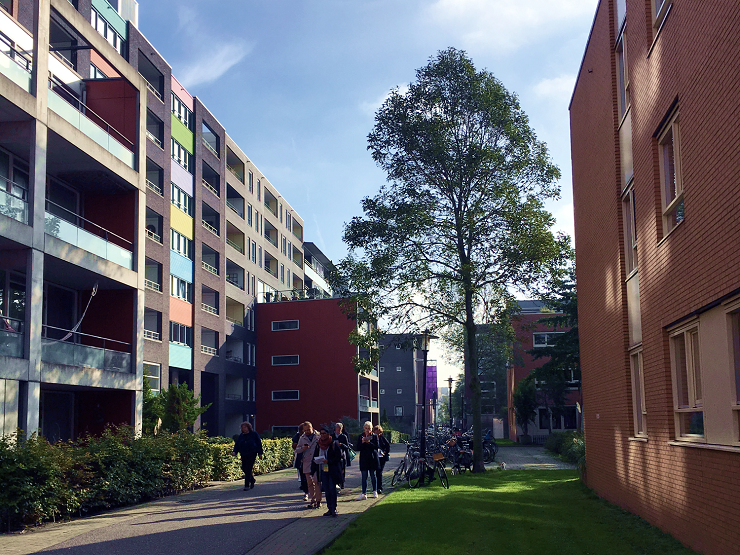 From October 10 to 14, urban experts and trend setters from all over the world were gathered in Amsterdam at the annual forum held by the Project for Public Spaces: the Amsterdam Placemaking Week. The event took place in the Pakhuis de Zwijger, a beautiful architectural reminder of the city’s seafaring, trading and industrial heyday. For the architecture and urban geek in me, this was already a good start! Not only was this an incredible opportunity to hear people from the urban field discuss and debate, but it was also a way for me to confront the reality of grand planning concepts I had consistently learned about for the past five years through books, lectures and seminars in the French, Chinese and British academic worlds. My involvement through the Bernard van Leer Foundation, and its Urban95 initiative, was to push forward the agenda of child-friendly urban design and planning into the realm of placemakers, whose objective is to turn (physical) spaces into (human) places. 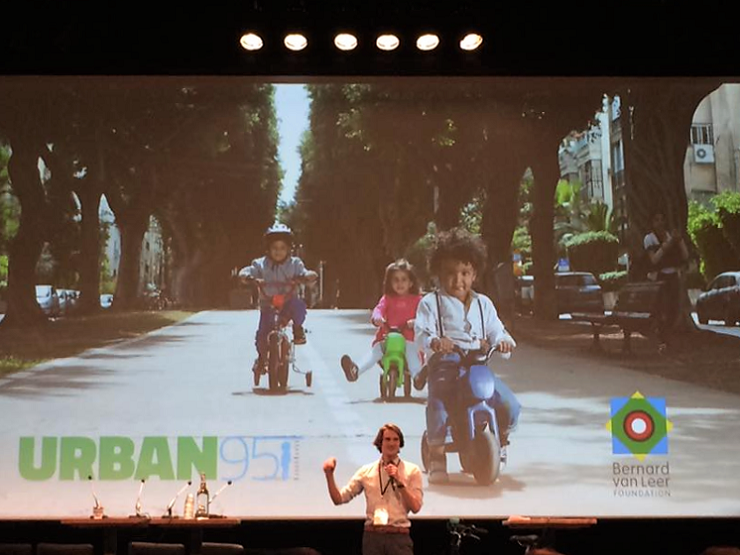 On Thursday 12, Ardan Kockelkoren launched our argument by giving a powerful 6:50 min Pecha Kucha presentation on Urban95. The next day, Dr. Sukanya Krishnamurthy from Eindhoven University, Ikumi Nakanishi from Arup, and Patrin Watanatada, Leontien Peeters and myself from BvLF organised a 90-minute workshop on child-friendly urban design, in an attempt to put our ideas into practice. 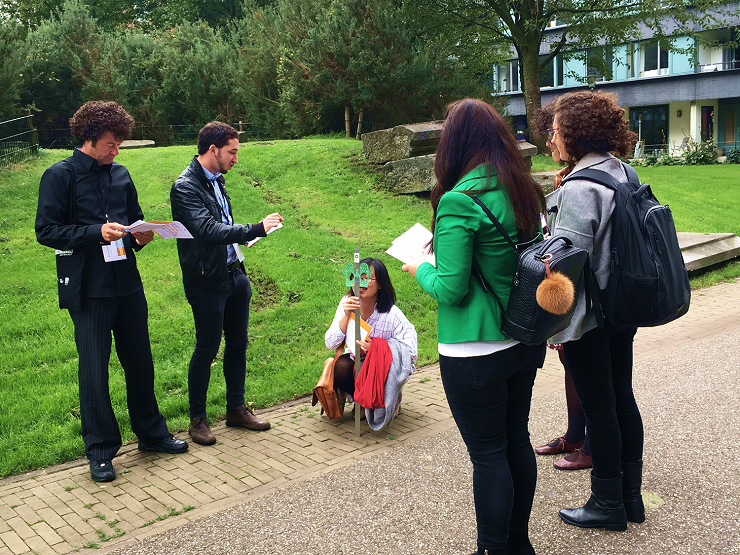 We invited around 40 participants from all backgrounds to join us and use an assessment tool-kit developed by Sukanya to analyse parts of Java Eiland, a 10-minute walk from the venue. In order to test out the tool-kit in real life and refine it, but also to increase awareness on how young children navigate public spaces, we brought them to four public courtyards. They had to assess the child-friendliness of the place using the tool-kit. In our closing discussion, it was fascinating to see how much people could see in a small area if given a specific lens to look through – that of a 95cm child! Comments as specific as sidewalk materials or types of plants, all the way to general concepts of playability or safety, were mentioned. 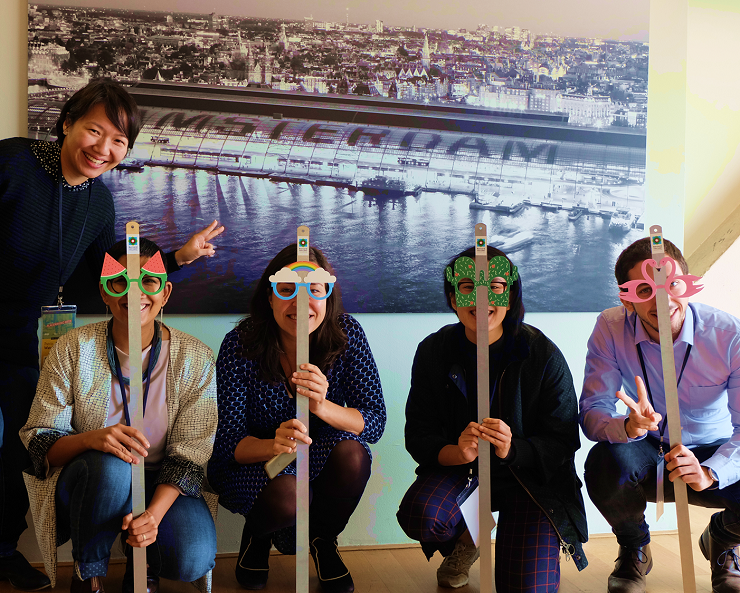 Our 95cm perspective-taking goggle props were incredibly popular, as it seems participants enjoyed reverting back to their childhood selves! The end discussion, which could have continued for hours, was a combination of enriching comments on the areas studied and on the tool-kit itself, and also led to a number of side discussions, which I realised after being engaged in one for about 10 minutes was actually networking! Being new to this, I was surprised by how easy it was to connect, and by how interested in our approach the participants were. Yet what struck me the most was how concretely anchored in real-life situations these discussions were. I was used to discussing theories on economic planning of cities or historical evolutions of density, or even how sustainable architectural principles are connected to the philosophical foundations of western societies. Yet here we were discussing what works, what doesn’t, or what to improve from a set of concrete situations. We were comparing street layout or the muddiness of natural play areas. My favourite idea was that, in order to prevent children from heading towards dangerous areas such as water and roads, public space could be designed using materials and colours that would convey warnings rather than resorting to fences! I realised at this moment that by focusing on young children in cities, I was developing a concrete, impactful perspective on urban planning in general. Excited by all the creative ideas, I then ended up joining conferences on other topics for the rest of the afternoon, glancing at the outstanding building or gorgeous maps on the walls, or simply chatting with fellow conference goers. Organising this fascinating workshop at the Amsterdam Placemaking Week, which I enjoyed designing as much as facilitating, and using Sukanya’s tool-kit to anchor a very specific child-friendly vision into placemaking debates, made me discover a whole new grounded, concrete and down-to-earth perspective on urban planning. I loved it! Follow the BvLF team at CityLab Paris from October 22-24 live via Twitter, or by checking out #Urban95, #CityLabParis. You can also find us on Facebook or Instagram or subscribe to our Urban95 newsletter.